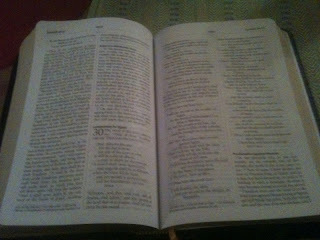 Last night, as part of our nightly devotional, my wife and I read the selection on Psalm 51 found in the Praying the Psalms with the Early Christians book which I highlighted a few weeks ago. As I mentioned there, this fine devotional focuses on 34 particular Psalms, including various selections from the Early Church Fathers. Last night, we read the entry on the very famous Psalm 51. It is one of the main penitential Psalms of the Church, most notably read every Friday morning in the Liturgy of the Hours. After reading through this Psalm, we were treated with three short reflections from the Church Fathers, including Clement of Rome, John Chrysostom, and Augustine. Although fairly short, Augustine's reflection on Psalm 51 is very poignant, since it helped me to look at Psalm 51 from a different vantage point. So, I want to share that reflection with you know, which comes from his Exposition of the Psalms, which I copied and pasted from, the helpful and inexpensive, The Faith Database. I hope you enjoy it! "To thee Nathan the prophet hath not been sent, David himself hath been sent to thee Hear him crying, and with him cry: hear him groaning, and with him groan; hear him weeping, and mingle tears; hear him amended, and with him rejoice. If from thee sin could not be excluded, be not hope of pardon excluded. There was sent to that man Nathan the prophet, observe the king's humility. He rejected not the words of him giving admonition, he said not, Darest thou speak to me, a king? An exited king heard a prophet, let His humble people hear Christ." Merry Christmas to you all. Thanks for stopping by over the past year. I look forward to discussing, debating, and analyzing all things Catholic Bibles with you in 2010. Catholic philosopher Peter Kreeft has a fine article on Christmas posted at the following site: http://catholiceducation.org/articles/religion/re0008.html. Check it out! Having already begun a new liturgical year with the first week of Advent, we will soon be entering into the calendar year 2010. I don't know about you, but boy does time fly! The upcoming new year got me thinking about what I would, realistically, like to see happen in the world of Catholic Bibles. So, I decided to list a few of them below. 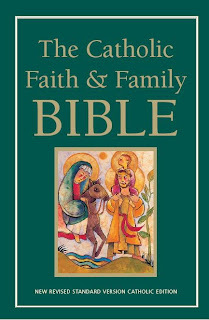 While there are a ton of things I could list, keep in mind that I tried to be as realistic as possible, recognizing the realities of the issues we have discussed on this blog concerning Catholic Bibles. Over the past few years, the amount of quality Bible study material for Catholics has dramatically increased. Just looking back this past year, we have seen the release of Hahn's Catholic Bible Dictionary, Emmaus Road's The Catholic Bible Concordance, as well as additional Catholic Bible commentaries including the Navarre New Testament, The Catholic Commentary on Sacred Scripture's "Ephesians" and "2 Corinthians", and the final volumes of the Ignatius Study Bible New Testament. There are others which I could mention, like the Faith Database, but I think you get the idea. What can we look to in 2010? Well, Ignatius Press will be releasing the one-volume Ignatius Study Bible New Testament. It is scheduled to be released in early Spring, with the first editions of the Old Testament coming soon after. I would hope that the Old Testament volumes would come out at a much quicker pace than the New Testament ones. (It would be nice, if this blog still exists in 2019, that one of my hopes for 2020 would not be the "upcoming release" of the complete 1 volume Ignatius Study Bible.) There will also be additional volumes in the Catholic Commentary on Sacred Scripture released as well. I am also interested in checking out the 4th Edition of the New Oxford Annotated Bible, which will be released in February 2010. This has only taken almost twenty years to complete. The Revised NAB NT was completed in 1986, with the dreadful revised Psalms in 1991. Since then, we have been stuck with a rather inconsistently translated American Catholic Bible for almost two full decades. Yet, there is some hope, with the NAB OT revised and approved and a re-revised Psalms in the works. If the revised OT and Psalms match the NT, I think it will be a decent translation overall. This would bring the entire NAB into the more formal category, slightly behind the RSV and NRSV. Also, it wouldn't be a bad thing either if they could incorporate some of the differences between the NAB we hear read at Mass into the one we read at home or in Bible study. Being able to read "Rejoice/Hail full of grace" in Luke 1:28 would be delightful! So what are you hoping for in 2010? Over the weekend I had a few spare minutes and decided to count the number of changes between the RSV-CE and the RSV-2CE. 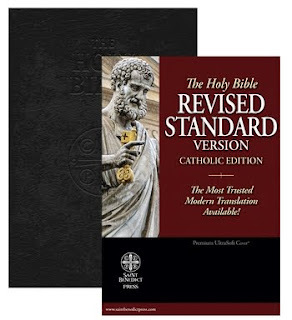 Using the Emmaus Road Publishing Catholic Bible Concordance: Revised Standard Version: Catholic Edition, I came up with well over 2500 changes between the original and the updated. In all actuality, it may be closer to 2800, but I can't confirm that I always hit the right button on the computer when adding it all up. :) Safe to say, however, the number of changes are significant. Keep in mind, this does not include the changes made to the archaic language in the original RSV-CE, like the "thees" and "thous". So, overall, that is a pretty hefty number in my book. Certainly worth giving the RSV-2CE a second look. I wonder how this would compare to the ESV? Update: A few years back a guy, mmortal03, on the Catholic Answers forums tabulated some of the changes in the new RSV-2CE. This was well before the Emmaus Road Catholic Bible Concordance was released and which documented all of the changes. However, his list remains helpful, in particular when comparing the RSV-2CE to the the original 1966 edition of the RSV-CE and the subsequent updates done by Oxford University Press. So check it out! Over the past few weeks I have expressed some frustration with Saint Benedict Press with the delay in receiving their new RSV-CE. However, one of the managers read about my frustration, here and on another blog, and contacted me directly to resolve the problem. She was very nice and helpful, and assured me that this was an anomaly, which I certainly believe is the case. I look forward to ordering more books from Saint Benedict Press in the future. The good news: I received the genuine leather RSV-CE yesterday in the mail. The even better news: Outside of one major omission, this is a really fine edition of the RSV-CE. Well, I would like to mention the most obvious upgrade is the page layout. It is by far the best page layout of any RSV-CE that I own. It is a very clear, clean text including bolded paragraph headings. It is very easy on the eyes to read. (Those who need a larger print can also purchase a large print edition in 12 point font.) 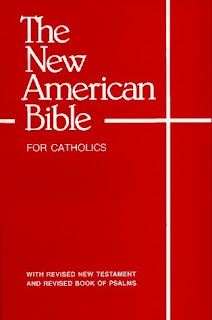 The inside cover of this Bible mentions that it was published in association with HarperOne/HarperCollins, which brought to mind the page layouts of the recently released NRSV Catholic Gift Bible and Life With God Bible. All three of them are similar, which is a good thing. This is definitely superior to the older Ignatius/Scepter editions of the RSV-CE. Included, of course, are the original RSV-CE explanatory notes, which are placed as end notes at the back of each Testament. Now onto the genuine leather cover. It is nice to finally be able to hold a Catholic edition of the RSV in a genuine leather cover. (Yes, I am aware of the RSV-CE from Oxford, but this Bible has so much more included in it, while not appearing like it was simply enlarged from a compact version of itself.) Now don't get me wrong, this is not a calfskin leather cover or anything, but it is a definite improvement upon the typical bonded leather editions of the RSV-CE or RSV-2CE. At first it is a little stiff, but I am certain this will improve after continued use. Those who are interested in a more softer cover, the synthetic leather/Italian duo-tone type covers can be purchased as well for this new RSV-CE. It also comes in paperback. The fine people at Saint Benedict Press also included a number of extra features, which are typically lacking in most editions of the RSV-CE. These include: Presentation and Family Record pages, a section of New Testament maps, four full color pictures of artwork (I particularly like the El Greco Christ on the Cross), and a calendar of readings for the 3 Year Sunday Liturgical cycle as well as the weekday readings. Bravo! In addition, there is a ribbon marker included and the words of Christ are in red in the Gospels, which I don't care either way about, although I know some people who are passionately for or against this inclusion in Bibles. So, overall, this is a very fine edition of the RSV-CE. There is, however, one fairly huge omission in my mind, which all of you who read this blog will know instantly what it is. There are no cross-references! D'oh! So close! I am not sure why the RSV-CE cross-references aren't included, perhaps it has something to do with the arrangement with HarperOne. The RSV-CE editions published in the past by Ignatius and Scepter, which are identical by the way, both included cross-references. Let me just conclude this review by saying that this edition is very good overall. I like everything about it, except it's one major omission. It will certainly meet your needs for an every day RSV-CE reading Bible. I am sure it will make a great gift as well, particularly due to the beautiful presentation box that it comes in. Below is a photo I took with my IPhone of the page layout. Let me start off by saying that not all of these books were released in 2009. Three of them were indeed released this past year, the two others in 2008. In either case, I read all of these books in 2009 and recommend them to all. This fine book has become the nightly devotional that my wife and I read before going to sleep. It includes the RSV translation of 34 Psalms, with short reflections from the early Church Fathers. The short reflections are freshly translated in more modernized language. 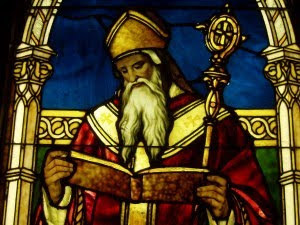 Some of the Fathers that are included are Augustine, Ambrose, Cyril of Jerusalem, Athanasius, and Jerome. This is a great little devotional book. This fairly thin book has been a real blessing to me. While I always enjoy reading the Holy Scriptures for Bible study and teaching class, I have often felt that my praying of Scripture has been rather poor. Sure, I pray every day with the Bible, but it hasn't always been as fruitful as it should. Fr. Gallagher's book focuses on Ignatius of Loyola's two basic methods of praying with the Bible: meditation and contemplation. The book does a great job at explaining the Ignatian method, along with dozens of real-life experiences by the typical lay reader. For those of you who haven't been introduced to the Ignatian way of praying Scripture, this book is a nice introduction. The God of Jesus Christ: Meditations on the Triune God by Pope Benedict XVI. You didn't think I was going to have a list of my favorite books of the year without giving a nod to B16 did you? Well, this is one of the books that was released last year, but it was required for my Christology class last Spring. I am glad that it was. This book is a collection of edited papers by the then Cardinal Ratzinger focusing on each of the three persons of the Holy Trinity. It seeks to answer the question that Rahner asked years earlier about whether belief in the Trinity mattered to the average Christian. Cardinal Ratzinger believes that the proposition that "God is three and God is one" is essential and "if this proposition had nothing to say to us, it would not have been revealed (29)." Let me finish with one of his quotes concerning the Holy Spirit: "Unlike Father and Son, the name of the third Divine Person is not the expression of something specific. It designates that which is common in the Godhead. But this reveals the 'proper character' of the Third Person: he is that which is common, the unity of the Father and the Son, the unity in Person. The Father and the Son are one with each other by going out beyond themselves; it is in the third Person, in the fruitfulness of their act of giving, that they are One (109)." As this book points out, while there has been many books written over the past few years about a variety of issues surrounding Pope Benedict XVI, very few, if any, have concentrated on his Biblical theology. Which is somewhat surprising, since the one major book he has released, as Pope, Jesus of Nazareth, is precisely a biblical examination of the life of Christ. (And of course, part II is set to be released next year.) This book proves to be is a fine overview, and it is written in a style that encourages the reader to read Benedict/Ratzinger for themselves. There are plenty of footnotes to entertain and delight those who want to do further reading. Spotted this film at the Intentional Disciples blog. For more info on those who made the film, you can go to their site Outside da Box. Matt, at his blog Absolutely No Spin, has a fine review of the Saint Benedict Press Large Print Douay-Rheims, with lots of pictures. Well, it has been a few months since I had a contest on this blog, so I think now is as good a time as ever to have another one. Consider it a "Catholic Bibles Advent Contest". 1) New paperback edition of the Saint Benedict Press Douay-Rheims Bible. Enjoy the Christmas season with this old classic! The winner must be the first one to answer the following questions correctly. You have one chance to answer, since I will not accept multiple entries by the same person. The entry deadline is Friday, December 11, at Noon EST. Make sure to have your name at the end of your entry. I will announce the winner in the comment box on Friday or Saturday. Sorry, but I will only ship to locations in North America. 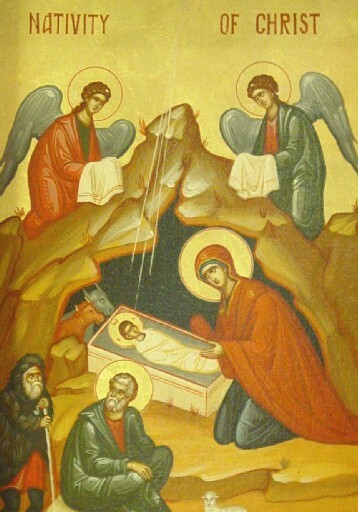 1) Who is the person credited with dating the birth of Christ, thus establishing the use of B.C. and A.D. ? What year did he do this? 2) According to tradition (lower case "t"), what are the names of the Three Kings and what kingdoms did they rule? Update: Winner announced in Comment Box! If you are wondering why I haven't blogged a review of the recently released Saint Benedict Press RSV-CE, in black genuine leather, well the reason is I have yet to receive it in the mail. I placed the order back on Friday November 13 with Saint Benedict Press, who said it would ship in 1-2 business days, but still nothing has arrived. As a matter of fact, I even paid extra for 2 day air shipping, in order to expedite the delivery. After multiple emails to customer service which were never answered, I was finally able to get someone from customer service on the phone on three separate occasions to find out the status of my order. And to be honest, I am still not sure what is going on. I have been told that the new RSV's are in stock, but are "in the process" of being shipped. How long does that take? Oh well, I will try and let you all know what this new RSV-CE is like, once I actually can hold it in my increasingly frustrated hands. May all of you have a blessed Advent Season! I bow down toward thy holy temple and give thanks to thy name for thy steadfast love and thy faithfulness; for thou hast exalted above everythingthy name and thy word. All the kings of the earth shall praise thee, O LORD, for they have heard the words of thy mouth; and they shall sing of the ways of the LORD, for great is the glory of the LORD. For though the LORD is high, he regards the lowly; but the haughty he knows from afar. Though I walk in the midst of trouble, thou dost preserve my life; thou dost stretch out thy hand against the wrath of my enemies, and thy right hand delivers me. The LORD will fulfil his purpose for me; thy steadfast love, O LORD, endures for ever. Do not forsake the work of thy hands. Glory to the Father and the Son and the Holy Spirit, as it was in the beginning, is now, and will be forever! The most numerous and consistent change from the RSV-CE to the RSV-2CE concerns the use of the Hebrew word ben in the Old Testament. Used most often in the Pentateuch, this change occurs some 526 times in the RSV-2CE Old Testament. A well-known example comes from Exodus 1:9, which the original RSV-CE translates: ""And he said to his people, "Behold, the people of Israel are too many and too mighty for us."" In most Bibles, including the RSV-CE, KJV, Douay-Rheims, NAB and NRSV, the translators go with either "the people of the children of Israel" or "the children of Israel" or just simply "the Israelite people". The RSV-2CE revisers went with "the sons of Israel" consistently. The NASB comes closest to the RSV-2CE by translating this phrase "the people of the sons of Israel", which seems to be the most literal rendering of the Hebrew. I wonder why the RSV-2CE revisers didn't simply go with the NASB rendering? The next change that I am going to post on, between the RSV-CE and RSV-2CE, is the use of cup/chalice. 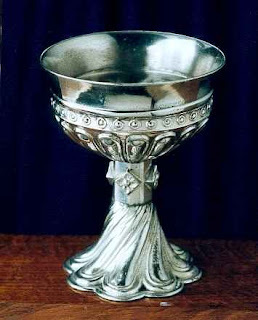 The RSV-2CE changes on 17 occasions the standard translation of the Greek poterion from cup to chalice. The occurs in the New Testament on 16 occasions, most notably during the Last Supper. There is also one case in the Old Testament where the RSV-2CE, translating the Hebrew word kowc, goes with chalice. It is found at Psalm 116:13. So what do you think? I am not too sure that I like the change, since I don't really think it is necessary. In my honest opinion, I think the RSV-2CE revisers meant to heighten the Eucharistic tone of those passages by substituting "chalice" for the more simple "cup". Today's first reading at Mass comes from 2 Maccabees. 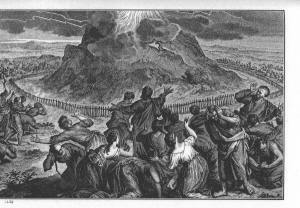 It happens to be one of my most favorite Old Testament stories. Two things stand out in my mind: 1) It is nice hear an OT selection of this length. Oftentimes, the first reading is condensed down to a small selection, but today you get to hear the entire story; 2) I would imagine that those earlier Christians who heard this story of Eleazar were fortified in their faith, certainly during times of persecution. While there are some Christians who don't accept the canonicity of 2 Maccabees, we can all agree that Eleazar's steadfast faith is to be greatly commended. Eleazar, one of the foremost scribes,a man of advanced age and noble appearance,was being forced to open his mouth to eat pork. But preferring a glorious death to a life of defilement,he spat out the meat,and went forward of his own accord to the instrument of torture,as people ought to do who have the courage to reject the food which it is unlawful to taste even for love of life. Those in charge of that unlawful ritual meal took the man aside privately,because of their long acquaintance with him,and urged him to bring meat of his own providing,such as he could legitimately eat,and to pretend to be eating some of the meat of the sacrifice prescribed by the king;in this way he would escape the death penalty,and be treated kindly because of their old friendship with him.But Eleazar made up his mind in a noble manner,worthy of his years, the dignity of his advanced age,the merited distinction of his gray hair,and of the admirable life he had lived from childhood;and so he declared that above allhe would be loyal to the holy laws given by God. Eleazar spoke thus,and went immediately to the instrument of torture.Those who shortly before had been kindly disposed,now became hostile toward him because what he had said seemed to them utter madness.When he was about to die under the blows,he groaned and said:“The Lord in his holy knowledge knows full well that,although I could have escaped death,I am not only enduring terrible pain in my body from this scourging,but also suffering it with joy in my soul because of my devotion to him.”This is how he died,leaving in his death a model of courage and an unforgettable example of virtue not only for the young but for the whole nation. I just wanted to briefly direct you to a new Catholic Men's Fellowship site that includes some really good talks from Men's Conferences in the Detroit area and elsewhere. In addition, the site also contains a multi-part series by Dr. Peter Williamson, of Sacred Heart Major Seminary, on the Book of Revelation. When I was doing graduate work at SHMS in Detroit, Dr. Williamson was one of my favorite professors. He has the great gift of being able to combine the important theological/scriptural information with its various pastoral applications. Currently, he is the head of the Scripture department at SHMS and is the editor of the new Catholic Commentary on Sacred Scripture series. So, check it out! All of the talks are free. St. Benedict Press, recent publishers of the venerable Douay-Rheims Bible, have now published their own edition of the RSV-CE. While I have yet to see any specifics about the edition, it does, however, come in many different cover options, including genuine leather, paperback, and Premium UltraSoft (imitation/pacific duvelle/Italian Duo-tone). It is also available in standard and large-print options. I will try to post more info on these editions as soon as I can find it. 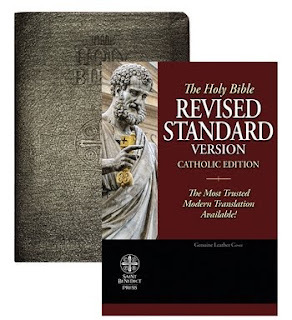 The Revised Standard Version Catholic Edition Bible (RSV-CE), translated from the original Greek and Hebrew, is known for its clear, contemporary language which makes it accessible to the modern reader and yet preserves the meaning of the original text. This Saint Benedict Press edition has been tailor-made for prayer and study. Its beautiful, easy-to-read design is preferred by 9 out of 10 readers! The unique features below, and many more, will help you use The Holy Bible to deepen your life with Jesus Christ. I ordered the black, genuine leather edition of the RSV-CE last week, but have yet to receive it. I also emailed St. Benedict's Press customer service at least three times and haven't received a response either. I will let you know more about this edition once I either receive a response from St. Benedict's Press or when I am holding the Bible in my hands. The Vatican has released the Apostolic Constitution on the Anglican Ordinariates. Included with the Consititution is a press release, as well as canonical commentary. The title of the Apostolic Constitution is ANGLICANORUM COETIBUS, which means "On Groups of Anglicans". Like no other Bible. 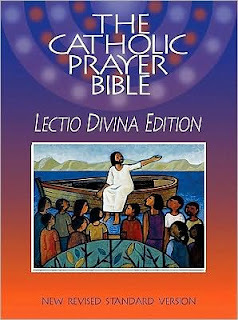 As Pope Benedict XVI reminds us: "I would like in particular to recall and recommend the ancient tradition of Lectio divina: the diligent reading of Sacred Scripture accompanied by prayer brings about that intimate dialogue in which the person reading hears God who is speaking, and in praying, responds to him with trusting openness of heart (cf. Dei Verbun, n. 25). If it is effectively promoted, this practice will bring to the Church - I am convinced of it - a new spiritual springtime." Lectio divina is simple enough to be done any place where there is some quiet or peace, and at any time of day when you can find a few minutes. It can last for as long or sort as you wish to make it; you can spend three minutes or fifteen. And it is intended for everyone, for you -not just for those people you may think of as elite in some way: priests and religious, the very educated, or the very pious. Everyone - including you as you are right now - can find pleasure and spiritual enrichment in Lectio divina. This Bible, which is like no other, invites readers, whether individually or in groups, to read the Bible more completely and prayerfully. It is the perfect way to give the gift of prayer to yourself and to those you love. 2,500 pages. 1 )Clarity of language, as in "plain speaking", 2)A reliable, genuine, and credible power to transform lives, 3) An emotional expectation to find the love of God, 4) A rational expectation to find the knowledge of God. While being sponsored by mostly mainline Protestant churches, it does have a fair amount of Catholic participation as well. When completed, this new translation will also include the Deuterocanonical books. The CEB translation team has just released its version of the Gospel according to Matthew. It is available here as a .pdf file. One thing that immediately grabs your attention is the use of "the Human One" instead of "the Son of Man". While I laud their apparent desire for consistency, assuming that they will translate the same phrase in Daniel and Ezekiel as "the Human One", I don't think this is a good move overall. The term "Son of Man" has been a major part of theological and scriptural discourse for the past 2000 years. This is one area where my moderate position on the use of inclusive language begins to make me fell a bit uncomfortable. Of course, I am somewhat uncomfortable with labeling any translation "good" or "bad", and certainly not one that hasn't even been fully published. I think it is great that the CEB team has released a portion of their new Bible, so that we can look over it and point out things we like and dislike about it. I look forward to any future releases they decide to provide, particularly in regards to Paul's letters. I emailed Oxford University Press over the weekend asking if there would be multiple binding options for the NOAB 4th Edition. A customer service representative responded saying that "There will be alternate bindings available for this title when it is published." Good to hear! Sorry for the low amount of content over the past week, but I have been leading a school retreat as well as recovering from a nagging head cold. However, while I was sitting on the couch today, I did some searching on my I-Phone at the Oxford University Press website. What did I find you ask? 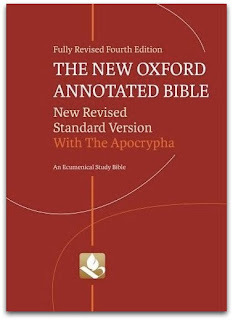 Well it appears that OUP will be releasing the 4th edition of the New Oxford Annotated Bible this coming February. So far, it is only listed to be released in hardcover editions. It will be 2480 pages with a size of 6 9/16 x 9", which would make it identical to the augmented 3rd edition. It seems strange, at least to me, that they would be releasing this edition so soon after the 3rd augmented edition, which came out only in January 2007. However, in many ways, the bar has been raised in the study Bible world with the recent releases of the NLT and ESV study Bibles. I hope they offer this edition with a genuine leather cover. 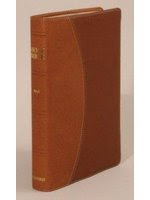 The premier study Bible used by scholars, pastors, undergraduate and graduate students, The New Oxford Annotated Bible offers a vast range of information, including extensive notes by experts in their fields; in-text maps, charts, and diagrams; supplementary essays on translation, biblical interpretation, cultural and historical background, and other general topics.Extensively revised--half of the material is brand new--featuring a new design to enhance readability, and brand-new color maps, the Annotated Fourth Edition adds to the established reputation of this essential biblical studies resource. Many new and revised maps, charts, and diagrams further clarify information found in the Scripture text. In addition, section introductions have been expanded and the book introductions present their information in a standard format so that students can find what they need to know. Of course, the Fourth Edition retains the features prized by students, including single column annotations at the foot of the pages, in-text charts, and maps, a page number-keyed index of all the study materials in the volume, and Oxford's renowned Bible maps. This timely edition maintains and extends the excellence the Annotated 's users have come to expect, bringing still more insights, information, and perspectives to bear upon the understanding of the biblical text. · Wholly revised, and greatly expanded book introductions and annotations. · Annotations in a single column across the page bottom, paragraphed according to their boldface topical headings. · In-text background essays on the major divisions of the biblical text. · Essays on the history of the formation of the biblical canon for Jews and various Christian churches. · More detailed explanations of the historical background of the text. · More in-depth treatment of the history and varieties of biblical criticism. · A timeline of major events in the ancient Near East. · A full index to all of the study materials, keyed to the page numbers on which they occur. · A full glossary of scholarly and critical terms. · 36-page section of full color New Oxford Bible Maps, approximately 40 in-text line drawing maps and diagrams. It has been a few weeks now since returning from the honeymoon to Italia, and only now do I feel like I am finally settling into a daily routine. The new job at the high school, while great, has also taken some time getting use to as well. But at some point during the past few days I began to feel comfortable, somewhat normal again. One of the reasons for this is that I have once again started making time each day to sit back and just read. It has been a few months since I finished a book, but I am very excited to be working on a number of them currently. Of course, it's not like I haven't done any reading over the past few months. But with marriage preparation, lesson plans, a honeymoon, and pair of senior retreats, there just seemed not to be much free time. However, that has now changed...I think. And I am very glad it has, because I have been able to start reading through two newly ordered books, which I have greatly enjoyed reading so far. The first book, which I am almost finished with, is Michael J. Gorman's Inhabiting the Cruciform God: Kenosis, Justification, and Theosis in Paul's Narrative Soteriology. Anyone who has read some of Gorman's other works will be familiar with the themes in this book. In particular, his analysis of kenosis in the Christ-hymn of Philippians 2, and its broader connections to the identity of the Triune God has made for some very interesting reading. Along with Gorman's book, I have also been skimming through Scott Hahn's Covenant and Communion: The Biblical Theology of Pope Benedict XVI. Hahn points out that many of the books written about Pope Benedict fail to capture his deep reliance on Scripture which is at the heart of his writings and teachings before and after his election to the See of Rome. The first part of Hahn's book spends considerable time discussing Pope Benedict's view of the historical-critical method. As Hahn points out, Pope Benedict sees the historical-critical method as being "an indispensable" tool for Biblical scholars. It is indispensable precisely because the Christian faith is based in history. Yet, while we must continue to use the historical-critical method in our exegesis of Biblical passages, we cannot separate it from the faith of the Church. Without faith, the text remains only a historical relic, which cannot be brought to the present. Ultimately, the Church is the guardian of the written Word. There is, of course, a lot more to this, but I have found this book to be a wonderful summary of Pope Benedict's Biblical theology. One last book that I have picked up, but have yet to start, is Scott Hahn's reworked doctoral thesis Kinship by Covenant: A Canonical Approach to the Fulfillment of God's Saving Promises. This is one of those books that is over 600 pages long, with half of it being end notes. Fun stuff! No....I really mean it! I hope to start this in the next week or so. So what are you reading these days? Any new releases that I should check out? This coming Sunday in the Roman Lectionary, we will hear the story of blind Bartimaeus. This is one of my favorite passages in the Bible, and it even includes the name Timaeus! In many ways, it is the hinge on which the Gospel of Mark turns, as the focus now turns to Jerusalem. I thought I would provide multiple translations of this passage, just to spur some discussion on how each handles it. (Mark 10:46-52) Although very similar, there are some subtle differences between the translations. For example, is there a major difference in translating the Greek word hodos as "way" or "road"? As Jesus was leaving Jericho with his disciples and a sizable crowd,Bartimaeus, a blind man, the son of Timaeus,sat by the roadside begging.On hearing that it was Jesus of Nazareth,he began to cry out and say,"Jesus, son of David, have pity on me. "And many rebuked him, telling him to be silent. But he kept calling out all the more,"Son of David, have pity on me. "Jesus stopped and said, "Call him. "So they called the blind man, saying to him,"Take courage; get up, Jesus is calling you. "He threw aside his cloak, sprang up, and came to Jesus. Jesus said to him in reply, "What do you want me to do for you?" The blind man replied to him, "Master, I want to see." Jesus told him, "Go your way; your faith has saved you." Immediately he received his sight and followed him on the way. They reached Jericho; and as he left Jericho with his disciples and a great crowd, Bartimaeus -- that is, the son of Timaeus -- a blind beggar, was sitting at the side of the road. When he heard that it was Jesus of Nazareth, he began to shout and cry out, 'Son of David, Jesus, have pity on me.' And many of them scolded him and told him to keep quiet, but he only shouted all the louder, 'Son of David, have pity on me.' Jesus stopped and said, 'Call him here.' So they called the blind man over. 'Courage,' they said, 'get up; he is calling you.' So throwing off his cloak, he jumped up and went to Jesus. Then Jesus spoke, 'What do you want me to do for you?' The blind man said to him, 'Rabbuni, let me see again.' Jesus said to him, 'Go; your faith has saved you.' And at once his sight returned and he followed him along the road. They came to Jericho. As Jesus and his disciples and a large crowd were leaving Jericho, Bartimaeus the son of Timaeus, a blind beggar, was sitting by the road. When he heard that it was Jesus the Nazarene, he began to shout, “Jesus, Son of David, have mercyon me!” Many scolded him to get him to be quiet, but he shouted all the more, “Son of David, have mercy on me!” Jesus stopped and said, “Call him.” So they called the blind man and said to him, “Have courage! Get up! He is calling you.” He threw off his cloak, jumped up, and came to Jesus. 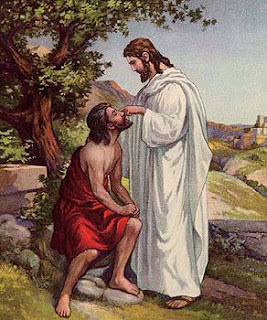 Then Jesus said to him, “What do you want me to do for you?” The blind man replied, “Rabbi, let me see again.” Jesus said to him, “Go, your faith has healed you.” Immediately he regained his sight and followed him on the road. Update: Michael Barber, from his blog The Sacred Page, has some nice info on this reading as well. It will be interesting to read the Apostolic Constitution once it is signed and released by the Pope. If you would like to read the Joint Statement made by the Catholic Bishop of Westminster and the Archbishop of Canterbury, go here. J. Mark Bertrand has a very fine post up about the recently released Oxford NRSV Notetaker's Bible. Mr. Bertrand is the Internet expert on all things concerning quality Bible covers and bindings. It is worth the time and effort to read through some of his past posts, which always come with fine descriptive pictures and commentary. Published in cooperation with Tan Books, St. Benedict's Press has released a new edition of the venerable Douay-Rheims Bible. I was able to examine a copy at a local Catholic book store a few days back and was impressed with the overall presentation of the Bible. 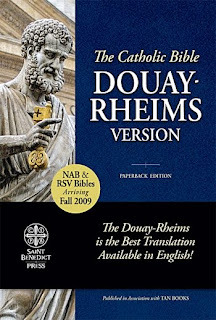 While I don't use the Douay-Rheims regularly, I have always hoped that there would be more stylish/modern editions of the Douay-Rheims available. This Bible is a definite step in the right direction. While some of the more recent Douay-Rheims releases have been fairly thick, this edition comes in the standard, medium size Bible range. The paper is the classic Bible paper you would find in most Bibles. The page layout is similar to that found in previous Tan Book Douay-Rheims releases, including cross-references and the classic verse notes. The edition I reviewed was the very flexible imitation leather/Durahyde cover. Our Douay Rheims Bible is the only edition available with the words of Christ in red! Includes updated full color New Testament maps, beautiful pictures depicting the life of Christ. Complete with Family record and Presentation pages. This beautiful Bible is available in a durable black leather-soft cover, with gold edges and a ribbon marker and is packaged in an eye catching presentation box. All in all, this is a very fine edition, particularly those who are interested in getting a stylistically newer edition of the Douay-Rheims. I only wonder why they didn't include any Old Testament maps, but overall it is an attractive edition which comes in multiple cover options. It also seems that St. Benedict Press will be producing similar Bible editions with the NAB and RSV. More to come as details are revealed! Update: Theophrastus the Great alerted me to an even better review of this new edition on another blog site. He even has pictures of the paperback edition.